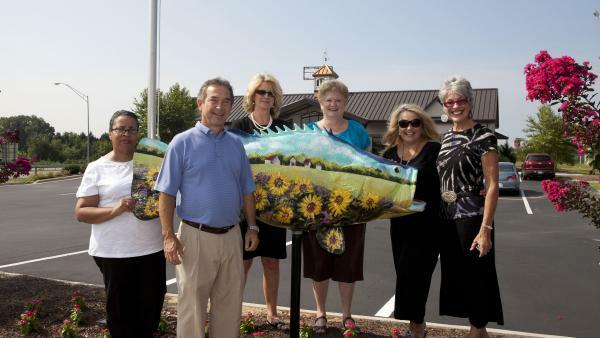 he Halifax County Visitors Center opened in its current location at 260 Premier Blvd. in April 2006. The building houses three entities: the Halifax County Convention & Visitors Bureau, the Halifax County Economic Development Commission and the Roanoke Valley Chamber of Commerce. Together these organizations offer one-stop shopping for anyone who comes through the door from providing travel information to relocation packets, from recruiting industries to assisting new businesses. Whatever the need, the staff of the Halifax County Visitors Center is ready to warmly welcome people to our area and to help ROCK the Roanoke Valley, making it THE place to visit, to live and to do business. Our rockfish was designed and painted by artist Tina Gregory. The scene of sunflowers and tobacco barns expresses the agricultural history and beautiful landscapes of our area. According to Tina, the scene is a combination of two of her favorite views – sunflowers from Joyce & Dean Kight’s farm and outbuildings from the Gregory family farm The Pines.